I'm looking at my timeline on my friend's phone and some of my posts look wrong. I mean the words are wrong. That's not what I typed! I think new phone is broken. Those are not my words! I'm getting rid of this phone, it's awful. As I keep saying. Don't buy iThings. I am a normal human typing with my human hands. "Mý fone ïs çaeñsoaring wat eye taip. My Brave 'Mobile Pro 3' is like something from a wholly New World. " Wonder which of those three methods would work? Unicode, fonetik substitoosion, or thinly veiled references? Garnasha wrote: "Mý fone ïs çaeñsoaring wat eye taip. My Brave 'Mobile Pro 3' is like something from a wholly New World. " My technological telecommunications device malefically substitutes verbiage not accurately portraying my intended sentiments. Just using obscure vocabulary has a good chance of working - or at least leaving a clear change in style as a result of the find-and-replace. It's not really a phone if it doesn't have a dial. I am thrilled by my new Palantír. sardia wrote: Isn't this more of a problem in review sites than phones? Fake reviews instead of phone censoring you. Or rather that people with a gripe (of whatever size, with whatever actual connection to the thing being griped about) are more motivated to review than the seamlessly-transitioned ones. Sableagle wrote: I am thrilled by my new Palantír. My two-cups-and-a-piece-of-string works perfectly. For people exactly 8'3" away from me. As long as there isn't a thick stone wall in the way (or a thin stone wall, brick and/or concrete wall, wooden fence/stud-wall-partition, plasterboard, glass or perspex window, awkwardly planted sapling, precious/non-precious vase, camp-fire, person with scissors…). Might work round corners, but at significant reduction of effective range and sound quality. ★★★★☆ (at least until the availability of half-stars, and white string to make it look like it's an Apple product). 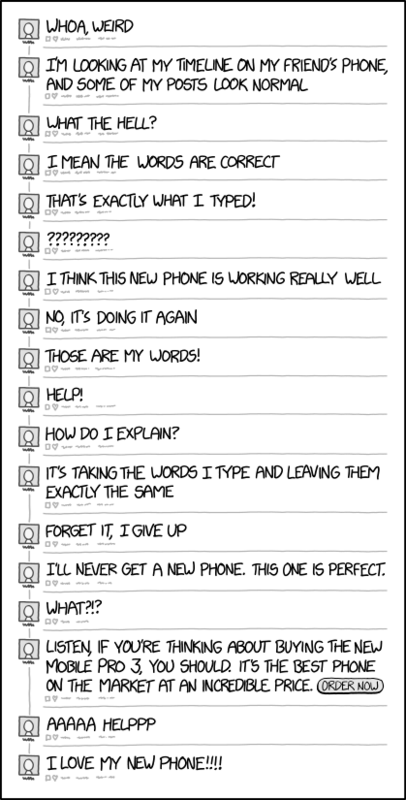 The joke here appears to be that the posts look like a perfectly reasonable chain of comments that someone might type, but they're really what the phone put there in place of the completely unrelated conversation that the user actually typed. It does look like it's editing things to their reverse. But at least it isn't trying to speak to parliament! I read this forwards, then backwards, then understood it on the third read-through. The non-obviousness makes the idea scarier, I think. "Siri, search the UK Houses of Parliament for conversations about security arrangements for Trump's visit to the UK." "Yes, Michael. I've found two conversations about that. I've saved them for you to listen to later, and am preparing transcripts." It's why the opposition benches are two Siri-lengths away. qvxb wrote: It's not really a phone if it doesn't have a dial. The first can be defeated by stripping accents before analyzing the text. The analysis would have to be based on a dictionary that is likewise accent-free, but that's easy to do and also happens to be how text analysis tends to be done anyway. The second can be defeated by converting text to speech (doesn't have to be all the way to audio; conversion to a string of phonemes is all that's needed here), and then converting the phonemes back to text using a statistical language model, so you'll get sequences of words that actually make sense. The third method won't work because even the intended recipient won't understand what you're trying to say. Having a phone like that would be a real joy to behold.